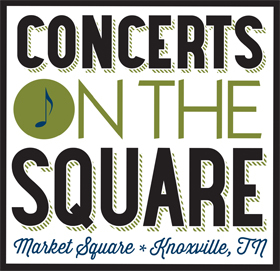 The City's Concerts on the Square Series is brought to you by the City of Knoxville and First Century Bank. Enjoy Jazz Tuesdays from 8-10 p.m. May 7 through August 27 on the Bill Lyons Pavilion. The Variety Thursdays concert series starts May 2 and ends June 27. From 7-9 p.m. on consecutive Thursdays, get a sampling of the wide variety of genres performed by local bands – from classical music to blues, from swing to Americana, from soft rock to country. This is a FREE concert series brought to you by First Century Bank and the City of Knoxville. Parking is free after 6 p.m. at the City-owned Market Square, State Street and Locust Street garages. No alcohol or food will be sold on Market Square proper, but there are many wonderful restaurants – some with patios – on the square with various food and drink choices. Downtown visitors can use the new public restrooms located in the Market Square Garage, near the Wall Ave. entrance. Stay informed about the bands performing and any weather-related cancellations by checking the City of Knoxville Special Events Facebook page at www.facebook.com/CityofKnoxvilleSpecialEvents.